Union Square Aberdeen Shopping Centre can be found at Guild Street next to the bus and railway station and opposite the harbour. Vehicle access is via Market Street. Cars should take the second exit on the right. Other shops in Union Square are on the ground floor: Hobby Craft, Mamas and Papas, JD Sports, Outfit, Miss Selfridge, Wallis (these are accessible from the ground car park), Boots, Cult, USC, Vero Moda, Jack Jones, Dune, AB10, Zara, Ale, TM Lewin, Paperchase, Faith, Fat Face, Sole Trader, H&M, Lab Sport, Optiko the opticians, Rox, Ollie and Nic, Azendi, Barrhead Travel, TK Max, Hugo Boss, Marks and Spencer Food Shop and Costa Coffee. There is a disabled toilet on the ground floor. Shops, restaurant and facilities on the first floor are: Jurys Inn, Wagamama noodle restaurant, Tinderbox espresso bar, Yo! Sushi, Frankie and Benny's, Pizza Hut (opening March 2010), Nando's, Ark Italian restaurant, Exquisite Designs, Urban Kids, Steak and Grill, Handmade Burger Co, Chiquito, Cineworld Cinema, toilets, baby changing rooms, disabled toilet and an area for public phones and cash machines soon to be build. Otherwise the nearest cash point is by the car park entrance to the railway station. Carluccio�s is to open its first restaurant in Aberdeen this summer and will create 35 full and part time jobs. It will be based on the first floor. This Italian restaurant group was founded by Antonio Carluccio, the well-known Italian cook. This is their second Scottish restaurant, the first being in Glasgow. It will offer all-day meals and a food shop with deli. Simon Kossoff, Chief Executive of Carluccio's, said: "We have been keen to open in Aberdeen for a number of years now and are delighted to have finally found the right site for us." Shop - Monday to Friday 9am to 8pm, Saturday 9am to 7pm, Sunday and Bank Holidays 11am to 5pm. Car parking costs are £1 an hour or part of an hour up to 7 hours and then �15 thereafter. After 6pm the car park costs �1. There is a minimum charge of £2 during the day. There are 1700 car parking spaces with many disabled parking bays. The car park is outside on ground level and also on multi storey. The easiest Aberdeen Car Valeting can be found on level two of the multi storey car park. This service uses auto glym products and there is a free air freshener with every auto valet. A car wash starts from �5-95, valets from �11-95 and car waxes from �5-95. 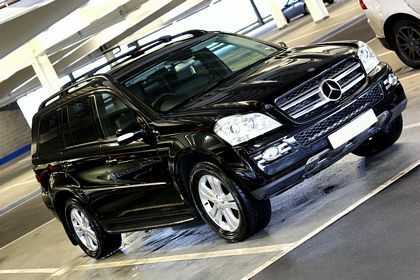 For more information visit the SS Autovalet website aberdeencarvalet.com for prices, opening times and how to book an Aberdeen car valet. Pure Spa Aberdeen offers a range of beauty and relaxation treatments such as manicures, pedicures, massages, sauna and spa treatments. Appointments range from 25 minutes through to one hour treatments: ideal to fit in between shopping of before a meal at the many restaurants. For more information about Pure Spa Aberdeen visit the Spa Aberdeen page. 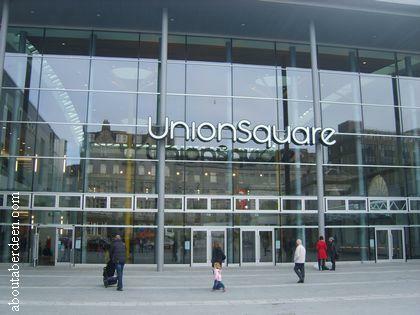 Union Square events keeps this Aberdeen shopping centre a pleasure to visit. Whether it is the fish in a tank that you soak your feet in whilst they nibble your dry and hard skin, the bungee leaping rides for children at the atrium, the eye brow shaping and removal service, the mobile gents hairdresser or the remote control racing cars: there is usually something to interest and please the family. The cafes, Cineworld cinema and restaurants, such as Wagamama ,Ask, Spur Steak and Grill and Giraffe, are involved in a new recycle scheme to turn food scraps to farmers compost with Scotland�s largest organic waste management company, Keenan Recycling. In the last six months the Union Square restaurants recycled 100 tonnes of food waste which local farmers used as fertiliser. This volume can be represented in the equivalent weight of ten double decker buses or 15 male elephants. The waste includes cooked and uncooked meat, fruit and vegetable peelings, left overs and even paper napkins and towels and is converted at New Deer in Aberdeenshire. Other green activities includes a green roof planted with coastal grasses which maintains the thermal dynamics of the building, roof wind catchers which provide a naturally ventilated mall and under floor and water solar heating. It is very positive for us to see food that would otherwise go to waste being turned into an organic material that can be used by local farmers. Some of those same local farmers provide our restaurants with produce so it�s fantastic to see the process working full cycle. It is important that every organisation plays their part in helping to reduce landfill and we are very proud to be part of the Keenan Recycling programme. Our commercial food waste recycling service has proved successful since we launched it last year and we are delighted to have secured work with all of the retail units that are generating food waste on a daily basis. The milestone is a great example of the amount of food which is now being diverted from landfill to be recycled into high nutrient compost. The Scottish Government is set to introduce legislation for mandatory food waste collection from businesses by 2013, therefore their commitment to green recycling is setting a superb example to other Scottish businesses. We are on heavy land and this type of BSI compost will help to open up the land. We are continually seeing the price of fertilisers increase so this is an excellent alternative for farmers which will also get nutrient values into the land. If it�s better for the land, it will improve the soil, improve yields and improve gross margins. A new Union Square restaurant is the Gourmet Pan-Asian restaurant COSMO which was its first Scottish branch, creating 50 jobs. This Oriental eatery comes after the demand from shoppers for a Chinese food eatery to open in the popular shopping centre. COSMO already has 11 restaurants in England and 1 in Wales. Job vacancies for COSMO Aberdeen are anticipated to be announced in January 2012. COSMO chefs create Eastern dishes from the seven countries of China, Japan, Korea, Malaysia, Thailand, Mongolia, Singapore, Vietnam and India and specialise in live cooking demonstrations so customers can watch their food being prepared as part of the dining experience. We are constantly looking to improve our customer experience and that means responding to what consumers are telling us, in this case, by bringing a taste of China to the centre. It also announced the signing of popular baker, Greggs, which has just opened a branch in the east mall area of the centre. Valentine Poems with the North East Poet Laureate shares Valentine�s prose with shoppers. Joining Sheena Middleton, the North East�s Poet Laureate will be some of our finest poets who together will bring soothing sonnets and potent prose. This will provide poetic inspiration to love struck shoppers looking to make their mark this Valentine�s Day with a personalised ode. Sheena Middleton became the Aberdeen and the North East of Scotland Makar in 2009 and was Creative Writing Fellow at Aberdeen University for five years. She lends her creative mind to hopeful poets throughout the afternoon on a first come, first served basis, just in time for Valentine�s Day. There will also be exclusive Valentine�s themed readings from a wide range of the North-East�s most talented poets throughout the day. The Union Square developer company is Hammerson and the scheme was first discussed by Aberdeen City Council Councillors in March 2000. It cost an estimated �250 million to build. Union Square Aberdeen opened on Thursday 29 October 2009 at noon. 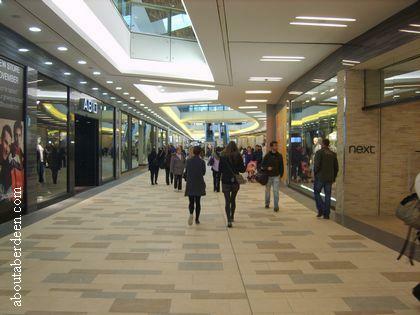 It was officially opened by David Atkins the chief executive of Hammerson. Dancers performed in the main atrium and the Red Hot Chilli Pipers performed. Over 10,000 people visit the shops within the first hour and by 8pm this rose to 58,500. On the first Saturday of opening there were 72,000 shoppers within five hours and this rose to 112,00 by midday. The restaurants say a brisk trade. For example Yo Sushi! served over 3000 customers in the first 3 days of trading and cooked over 12,000 plates of sushi. The voices for the adverts on STV when Union Square shopping centre opened were provided by Aberdonian actress Amy Lennox. The Cineworld cinema complex has ten digital screens, food shops and a bar. It was built on the old Guild Street railway station site that was used as a freight yard. The land also housed an old warehouse. 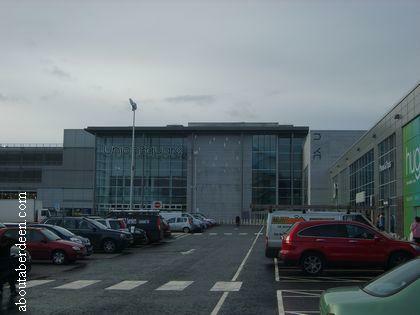 It became the second largest shopping centre in Scotland. It has a nine storey 203 bedroom hotel. It has 700,000 square feet of retail space. A community bursary scheme is available from Union Square shopping centre Aberdeen with a generous �20,000 available to local charities. This helps to support small community groups and charities in the City and Shire. Local charities and not-for-profit organisations are invited to apply for grants of up to �2,000 with the aim of supporting vital community work, across all age groups and backgrounds. Previous successful applicants to bursary scheme included Lairhillock Primary School who used the donation to build their dream greenhouse. Aberdeen�s Hip Hop School were able to run a summer dance school. Friends of the Reading Bus held poetry classes with local youngsters. Funding for this community bursary scheme comes from Union Square and donations from retailers. They also donate their time to support successful applicants with their cause or projects. Retailers who have to date pledged their time include Cineworld, Howards Storage World, Jack and Jones and Vero Moda, Hobbycraft and Handmade burger Co. 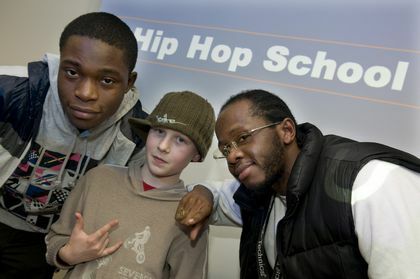 The community bursary helped us achieve our dream of taking hip hop out to a wider audience. Since the bursary, we�ve seen a number of talented dancers, song-writers and singers join us and we�ve been lucky enough to perform as a group at the AECC. It's extremely encouraging to see them continuing to support the local community in such a big way. Public finances are extremely tight in the current economic climate so it is very welcome to see the private sector stepping forward to make a valuable contribution. I would urge local groups to make a bid for a share of the bursary because an award of up to �2,000 could make all the difference to a community project. The community bursary scheme funding is available for projects that fit within the themes of art and culture, education and skills, health and wellbeing or sustainability and the environment. The projects must be of value to and generate tangible benefits for, their local community. Once applications have been received, a dedicated charity panel will select the projects that will benefit from the scheme. The panel includes Penny Godfrey, marketing manager and Ryan Manson, general manager, Tom Moore, City Centre Manager and Michelle Dawson, community manager, Hammerson. Those who donated money and time included Cineworld, Starbucks, Howards Storage World, Jack and Jones and Vero Moda, HobbyCraft, Sony Centre, SS Autovalet, Deichmann and handmade burger Co. Friend of the centre DJ Kojo will also be donating time as part of the project. Some of the projects and charities set to benefit from the scheme include the South Deeside under-fives childcare which will start a new project in August to teach young children about growing and harvesting their own vegetables, Danestone primary school which will be putting on a Money Week event to help the children better understand money management, Castlegate Arts Ltd which will use the funding to reward their 120-strong team of volunteers with quarterly social events and the MYPP Employability Caf� where the bursary will help staff to continue to provide job seeking support sessions for young people. We�re over the moon to be selected for the bursary scheme. This will mean that we can teach young children about the benefits of healthy living, eating and cooking and we�ll be making it as fun as possible thanks to the Bursary. We may even look at producing a cookery book at the end of the project, which will allow us to raise further funds for the group. We�d like to say a big thank you for allowing us the opportunity to do something fun and different with the children. Other beneficiaries of the bursary include the Broomhill Primary School whose teachers and pupils will be working on an art project to transform the school playground, CLAN Cancer Support which will be running special relaxation sessions for those who use the service and Kittybrewster School which will introduce lunchtime sports and activities clubs to children from regeneration areas. The 12 charities all presented inspiring projects which met with the Union Square�s four bursary themes of Art and Culture, Education and Skills, Health and Wellbeing and Sustainability and Environment. A dedicated charity panel, made up of Union Square officials, City Centre Manager Tom Moore, and Hammerson�s community manager, Michelle Dawson, were responsible for selecting the charities. Hammerson, the developers of Union Square Aberdeen, donated rail tracks from the site which was a former tram and train depot and goods yard to the Royal Deeside Railway Preservation Society. This is put to use in the restoration of the Banchory to Crathes line. Jobs in Union Square were given a boost when the developer, Hammerson, announced that they will be working with the Jobs For U programme and training scheme which helps to train people for the hospitality trade so that people can work in hotels, bars, restaurants, shops and gyms.